← What types of Anti-slip plate products we can supply? 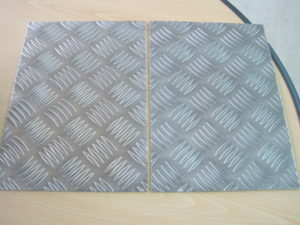 Aluminum checker plate is also called aluminum chequered plate. It is made fromaluminum sheet. One side of the surface is embossed with diamond platepattern. The different pattern can fit different environments and various usage.Aluminum checker plate is better for antirust and lighter than other materials, it can be used for many years and can retain high value after being replaced. This type of checkered plate is widely used as antiskid plate in both commercial and industrial flooring needs and also used in the vehicles, such as the ambulance and the firework truck. Material: High grade aluminum sheet. Thickness: 0.1″, 0.63″, 0.125″, 0.188″, 0.250″, 0.45″, 0.5″. Color: Siver, black, yellow, red. Alloy: 1000 series, 3000 series, 5000 series, 6000 series, 8000 series. Temper: O, H22, H24, H26, H32, H34. Resist corrosion and long life. Remain high value after being replaced. Aluminum checker plate has good skid resistance. So it is usually used in the loading ramps, trench covers, dock flooring, stair treads and even for the car, truck, ambulance and fire truck. It has the decorative function, so it can be used as decoration wall panels, cabinet and ceilings. Because of the anti- corrosion, it can be used in the chemical industry, or in the decoration of the ship and port facilities. This entry was posted in Aluminium Tread Plate and tagged Aluminum checker plate, Aluminum Sheet. Bookmark the permalink.